We’re creating a buzz in the garage sale scene! Our mission is to be THE place for finding or posting garage sales, as well as present a leading source of information for garage sale buyers and sellers. Merging the world of garage sale classifieds and Google Maps, the site has become the first of its kind to list literally thousands of sales plotted on an interactive and searchable map*. The result is one of the internet's fastest growing garage sale classifieds and resource sites in existence. In building the site, we set out to fix two big problems that are commonly seen in other garage sale and classifieds sites. Not enough sales and out-dated sales. Using a highly customized search engine, we gather sales from dozens of online sources including newspapers. The result is thousands of sales mapped every week. And, since our search engine only picks up sales with defined dates, we never show any out-dated sales. Two of the biggest problems in using the internet to find garage sales have now been solved. Weekend Treasure was founded in late 2006 by two young entrepreneurs. After discovering how much fun it was going to yard sales around their hometown of Santa Cruz, CA, the founders decided to create a website which would give people a way to easily find and map local garage and estate sales in their area. A virtual mecca of thrift sales, flea markets, and antique shops, Santa Cruz provides an optimal headquarters for Weekend Treasure. *The website recorded over 11,000 sales within North America on May 30th, 2009. 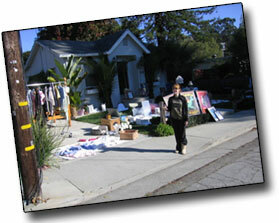 Fluctuations in volume due to the seasonal nature of garage sales can sometimes lead to lower weekly averages.